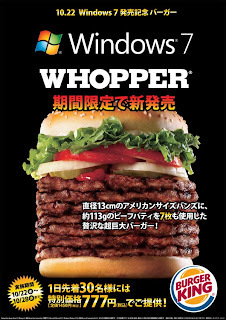 Windows 7 Launches Today - Who Wants a Windows 7 Whopper? Huzzah! The official launch of Windows 7 is finally upon us and to celebrate in Japan, Burger King is offering a very special Whopper; the Windows 7 Whopper! 7 patties of delici.... err gross! The first 30 people each day will get to buy them at ¥777... Advertising is a fun business, haha!